Home > JT Melia Moving Service Areas > Katy Movers > Why Move To Katy, Texas? Katy is Small Town, Texas, just minutes from the best restaurants, shopping and culture Houston has to offer. Despite its proximity to the big city, Katy has preserved its small-town ideals while evolving into a mature community in itself. Katy residents are 50% more likely to have earned a bachelor’s degree than the rest of the state and 15% more likely to hold a graduate degree. Per capita income is 50% higher than national levels and 24% higher than the three counties in which Katy lies. It’s a safe place to raise a family among other people who are going places. JTMelia Can Be Your Katy Mover! Need help moving to Katy? JTMelia Movers handles moves all over Houston and we can be your Katy mover! Check out our reviews and you will see many satisfied clients that have used us and referred us to their closest friends. When you need a hassle-free move from a mover that cares we cannot be beaten. We have been moving people in and out as well as around Houston since 1969. As one of the most established movers in Houston, you can rest assured that your move will be handled with care. Set on prairie land traditionally roamed by migratory birds, buffalo, cattle and wolves hunted by the Karankawa Indians, the clay soil makes the area less suitable for most farming. Cane Creek, one of the sources of Buffalo Bayou, gave the area its original name—Cane Island—and contributes to the area’s prime conditions for growing rice. Legend has it that the name Katy came from the Missouri, Kansas and Texas (M-K-T) Railroad, referred to as the K-T, which had a hub here. Or maybe Katy was the saloon keeper’s wife. Either way, the town was planned in 1895 but wasn’t incorporated until 1945. A large gas industry fostered Katy’s early growth. 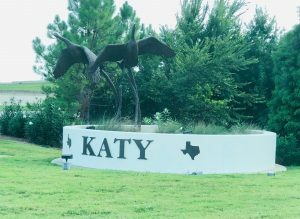 Only 50 years ago, Katy was still a sleepy little Texas town, but Houston’s westward sprawl along the Energy Corridor of Interstate 10 quickly transformed it first into an affluent suburb and finally into an appendage that nonetheless maintains its own small-town identity. As a mature suburb, the town offers the convenience of infrastructure such as restaurants and shopping as well as an established, award-winning school system. You could go into Houston for world-class shopping, but you don’t have to. We’ve got our own, right here in Katy. Looking for a party dress? Katy Mills offers everything from Off 5th to J. Crew to Polo Ralph Lauren. Need shoes? Step into Famous Footwear, Converse or Cole Haan. How about high-end accessories? Check out Kate Spade, Coach or Neiman Marcus Last Call. Bargain hunting? Visit Ross, Old Navy or H&M. Preparing for your fishing trip? Don’t miss Bass Pro Shops. Just off Grand Parkway, you’ll find LaCenterra at Cinco Ranch, a main street style center with an excellent selection of restaurants and stores. Terrific shopping includes Talbot’s, Gymboree, Francesca’s, Pandora and Sephora. Grab a Jamba Juice smoothie or celebrate your anniversary at Perry’s Steakhouse. Family Taco Tuesday can happen at Torchy’s or Las Alamedas. Shop for specialty and organic foods at Trader Joe’s. Visit the Farmers Market on the fourth Sunday of every month. The cities of Katy and Houston have run into each other, ever bringing conveniences and culture closer by, but Katy offers fun for the whole family (and just the adults), too. On third Saturdays from March to December, visit Katy Market Day in historic downtown Katy. Find great food, local vendors, antiques, art and other goodies. Get your brew on at No Label Brewery (http://nolabelbrew.com). Catch a show or take a class at the Katy Visual and Performing Art Center (https://www.kvpac.org/about-us/). Attend a horse show at the Great Southwest Equestrian Center (http://www.gswec.com). Almost every month holds a festival of some kind. Here’s a list (http://www.katychamber.com/RelocationVisitingKaty/LocalEvents.aspx). In 2016, com ranked Katy Independent School District (http://www.katyisd.org/ ) as the best in the greater Houston area. Several of its schools have been named National Blue Ribbon schools, and half of its high schools have been built in the last 15 years to account for the region’s rapid population growth. Expansion Management awarded Katy ISD its Gold Medal Award in 2004 and 2005, placing it in the top 17% nationwide. The Houston Community College system’s Katy Campus (https://www.hccs.edu/locations/northwest-college/katy-campus/) serves 4,000 two-year and continuing education students. HCC has purchased land to permit expansion to more than double its student body. In 2018, the University of Houston broke ground on a facility that will bring state four-year degrees back to the Katy area. Katy is served by retail electric providers. The state offers an objective, non-profit website where consumers can search and compare electricity rates available in their zip codes. Visit PowertoChoose.org.